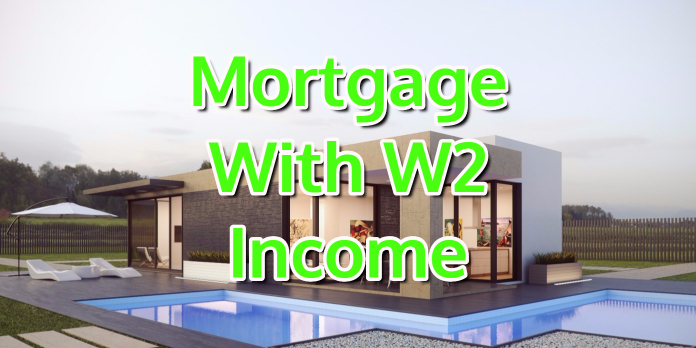 Mortgage With W2 Income: Is It Possible? If you are backed up against the wall and have non-traditional income, we have a definite option for you to get you a mortgage approval without Tax Returns or a written Verification of Employment (VOE) used to calculate your approval. Here at Loan Consultants we have many creative financing options and one that can be used here is qualification using on W2 income only. Using this financing option we can qualify borrowers only using their W2 income without showing their tax returns if they have a high amount of expenses written off. The only caveat with this type of calculation is that the borrower cannot be using 1099 income or have received a 1099 for income earned in the past 2 years. All we care about is properly recorded W2 income over the last 2 years. In this article I am going to go through the case scenario of how we took in a borrower that got declined from 2 previous lenders but got a loan commitment from us over the course of a weekend. It was a Friday night and the phone rings. It appears that Brian has gotten in contact with Loan Consultants. As we don’t work your standard 9-5 hours, we are available 24-7-365 and will always be there to help you. Upon getting the phone call from Brian and some basic information, we knew that we could help this man and were focused on putting him into his dream home and making this nightmare end. Between Friday night and Saturday Brian submitted all the documentation he had previously used with other lenders. Working all day Saturday and Sunday, we crunched the numbers to make sure we could get Brian approved for the mortgage he so greatly desired. We were close, but we just couldn’t pass our debt to income ratio to get a Fannie Mae approve eligible. How were we going to get Brian approved with a 50.8% debt to income ratio when Fannie Mae required us to get below a 45% debt to income ratio. After much back and forth and looking for all possible options, the light bulb went off and we got 2 ideas. Our first option was to try and get Brian approved using LP and Freddie Mac where under certain circumstances you can get approved with a 49.99% debt to income ratio. This would be great for us but we still needed a little bit more to reduce his debt to income ratio. That’s It!!! We can try to get a Mortgage With W2 Income. Under this option we can take his previous year’s W2 income and average it out over a monthly basisto get us an updated gross income basis for calculations. We crunched the numbers and when we updated Brian’s income we were left with a 49.6% debt to income ratio and an APPROVAL. We double checked our numbers to ensure we got everything calculated properly, and sure enough we did!